Childhood summertime in the mountains meant tying an emerald june bug to a string and letting it fly around your head, catching lightning bugs at dark and putting them in a jar to light your dreams, or piling in the Studebaker and going to the closest custard stand for a chili bun or slaw dog. Everything except the Studebaker is still a part of summer in the mountain South—especially the custard stand, which is often what a drive-in restaurant is called, even if it doesn’t serve custard. There’s the Dip Dog in Marion, Virginia; the Frosty-Ette in Sandgap, Kentucky; Skeenies Hot Dogs near Charleston, West Virginia. Pal’s Sudden Service all around the Tennessee-Virginia border; King Tut Drive-In in Beckley, West Virginia; Frosty Bossie in Coeburn, Virginia. These are just a handful of places my friends and I have frequented. All such serve ice cream treats, some make a mean burger, and the Sterling Drive-In in Welch, West Virginia, makes a deep-fried sub with chicken salad, cranberry sauce, and bacon as its filling. Really. But the aficionados know that what you really come for begins with chili on a hot dog bun. Here are the rules: Buns should be soft, not toasted. Either can be dressed with bright yellow ballpark mustard and chopped white onion, but ketchup, pickles, and/or kraut are largely frowned upon. Hot sauce—favored brands are Crystal, Tabasco, and Texas Pete—may be liberally applied by those who wish for more heat. Jalapeños? Well, now you’re talking schisms. Stir in the garlic, salt, and cracker crumbs and place the pan over medium-high heat. Bring the mixture to a boil, stirring to keep it from sticking to the bottom of the pot. Turn the heat to medium-low and continue to cook, stirring frequently to prevent sticking, until the liquid has largely evaporated but the mixture is still very moist, about 4 minutes. The chili should be a finely grained aggregate that holds its shape on the spoon. Stir in the tomato paste. Remove from the heat and stir in the ground chile or cayenne, cumin, and cinnamon. Cover and let sit for 5 minutes before serving. Chop the cabbage into small pieces, but don’t use a grater or food processor because that releases too much juice and makes the cabbage too tart. In a medium bowl, season the cabbage with the salt, and add pepper to taste (more is better). Thin the mayonnaise with the buttermilk or milk, and mix it well with the cabbage. Lightly paint the inside of a hot dog bun (see note below) with yellow mustard. Pack 3 or 4 heaping teaspoons of chili sauce into the bun, starting with a spoonful in the center and smoothing it in with the back of the spoon. Add more, moving out to either end and smoothing lightly as you go, until the bun is filled. (You’re not making a sloppy joe; the chili should be firm in the bun.) Top with chopped white onion to taste. Pass hot sauce on the side. Submerge hot dogs in boiling water for 5 minutes. Paint the inside of buns with yellow mustard, and sprinkle in chopped white onion to taste. Drain the dogs and pat dry. 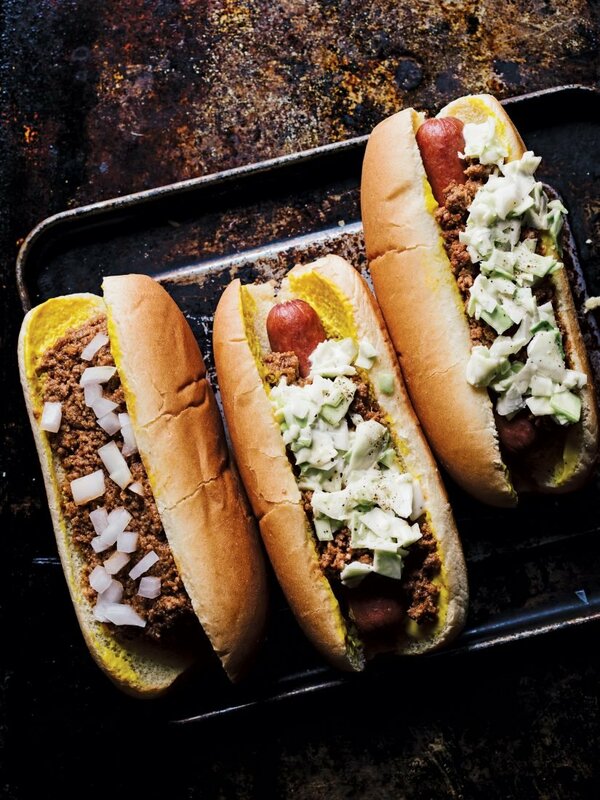 Place them in the buns and cover each with about 2 tablespoons chili sauce, then about 2 tablespoons slaw. Pass hot sauce on the side. Note: When buying buns, check the sugar content in the nutrition information. Some buns have as much as 4 grams. That’s way too sweet. Pick a bun with no more than 2 grams of sugar. Out this August, Ronni Lundy’s Victuals: An Appalachian Journey, with Recipes (Clarkson Potter), from which this story and these recipes are excerpted, is a love letter to the foods of Appalachia, a region the Kentucky native has chronicled and championed for more than twenty-five years. Chapters devoted to mountain staples such as corn, beans, and apples, and recipes for everything from tomato gravy to black walnut pesto, continue the work of a writer who planted the seeds for the recent revival of smoking, pickling, and cast-iron frying and has influenced some of today’s most prominent Southern chefs.